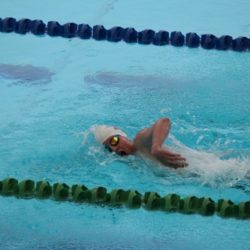 How to improve the second 50m in a 100m swimming race? I love reading your emails, I have a question with my son’s swimming. In a 100m race he goes well to the 50m mark then on the return he starts to loose form and races considerably slower. How can he improve the speed in the second half of his race? This is in all strokes. There are specific things that your son can do in practice that will help him improve the second 50m in each 100m swimming race. When he is doing 100m swims in practice, he should focus on this swimming the second 50m at the same speed or faster than the first 50m. This is called even pacing (same time) or negative splitting (when the second 50m is faster than the first) and I look at these closely in my book Behind the Goggles. While he may be unable to do this in a race, it will help him improve his second 50m. Another suggestion is to build all his swims in practice, when he gets the chance to. If he is going say 20 x 50m freestyle, practice building every 50m swim, and even get faster in the last 10 x 50s than the first 10. I’ve also had a lot of success doing dive sprints immediately following a hard set. This helps the swimmers to practice swimming fast even when they are tired, like they will feel in the second 50m of a race. Best wishes to your son and thanks for your support Dawn. Is his coach actually working on his technique or just doing mileage? Junior swimmers need a bulletproof technique as a foundation, otherwise all the pace training in the world is useless. No matter how fit he is he won’t go fast if he’s fighting the water. In our profession we have so many people who train swimmers rather than coaching them, there is a big difference. Dawn, Ian makes a really good point. 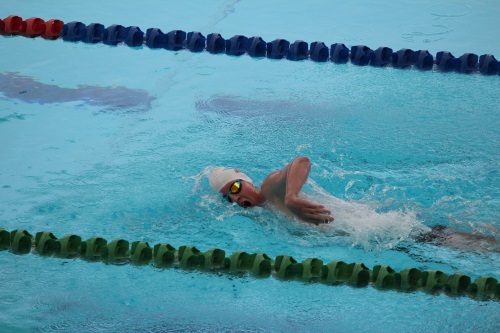 Swimming with correct technique is the foundation for all swimmers. The training vs coaching issue is my family’s biggest problem. Despite being with a club coaching is only offered to those in squads and to get into those you either have to achieve through the swim school levels they are attached to or meet certain time/achievement prerequisites. I am finding most of the young teachers in the swim schools just go through the motions and very few try and correct technique. Also, on the sceptical side I wonder if being a business they are also concerned with keeping you there longer. I’m finding it a frustrating sport to get coaching in. Any suggestions? My suggestion is to talk to someone involved in a management / leadership position where you swim and ask them for advice on the best way for your children to get involved. It may take a commitment in a certain level for a period of time to progress into an appropriate squad, but it will be worth it in the long term. A majority of swim schools are very good with their teacher training. Identifying stroke faults and knowing what to say and which drills to use to correct the faults is another step all together and some swim teachers struggle here. Yes there are also some swim schools who retain their children in the higher levels for too long as they are a business.